The problem is, every time I think I know why I blog, some other reason springs to mind. To record the world as it is. To set down the past before it is all forgotten. To excavate the past because it has been forgotten. To satisfy my desire for revenge. Because I knew I had to keep writing or else I would die. Because to write is to take risks, and it is only by taking risks that we know we are alive. To produce order out of chaos. To delight and instruct (not often found after the early twentieth century, or not in that form). To please myself. T express myself. To express myself beautifully. To create a perfect work of art. To reward the virtuous and to punish the guilty; or – the Marquis de Sade defence, used by ironists – vice versa. To hold a mirror up to Nature. To hold a mirror up to the reader. To paint a portrait of society and its ills. To express the unexpressed life of the masses. To name the hitherto unnamed. To defend the human spirit, and human integrity and honor. To thumb my nose at Death. To make money so that my children could have shoes. To make money so I could sneer at those who formerly sneered at me. To show the bastards. Because to create is human. Because to create is Godlike. Because I hated the idea of having a job. To say a new word. To make a new thing. To create a national consciousness, or a national conscience. To justify my failures in school. To justify my own view of myself and my life, because I couldn’t be a ‘writer’ unless I actually did some writing. To make myself appear more interesting than I actually was. To attract the love of a beautiful woman. To attract the love of any woman at all. To attract the love of a beautiful man. To rectify my imperfections and my miserable childhood. To thwart my parents. To spin a fascinating tale. To amuse and please the reader. To amuse and please myself. To pass the time, even though it would have passed anyway. Graphomania. Compulsive logorrhea. Because I was driven to it by some force outside my control. Because I was possessed. Because an angel dictated to me. Because I fell into the embrace of the Muse. Because I got pregnant by the Muse and needed to give birth to a book. Because I had books instead of children (several twentieth-century woman). To serve Art. To serve the Collective Unconscious. To serve History. To justify the ways of God towards man. To act out antisocial behaviour for which I would have been punished in real life. To master a craft so that I could generate texts. To subvert the Enlightenment. To demonstrate that whatever is, is right. To experiment with new forms of perception. To create a recreational boudoir so that the reader could go into it and have fun. Because the story took hold of me and wouldn’t let me go (the Ancient Mariner defense). To search for understanding of reader and myself. To cope with my depression. For my children. To make a name that would survive death. To defend a minority group or oppressed class. To speak for those who cannot speak for themselves. To expose appalling wrongs or atrocities. To record the times through which I have lived. To bear witness to horrifying events that I have survived. To speak for the dead. To celebrate life in all of its complexity. To praise the universe. To allow for the possibility of hope and redemption. To give back something of what has been given to me. At the end of the day, why we do anything is always complicated. In this myriad of explanations and elaborations, I therefore have another reason to add to my ongoing discussion about why to blog. My latest thought is that blogging provides a means for meta-reflection, the possibility to look back through past opinions and practises. An example of this in action is Alan Levine’s post ‘From Javier to Norbert‘. In it, Levine is able call on his vast digital repository to reflect upon past experiences of the Grand Canyon to recollect his experience of being caught in the canyon in the midst of a flood. It needs to be understood that such reflection is in addition to the actual act of reflection that is often a central part of each and every blog post. For as Clive Thompson accounts in his book, Smarter Than You Think, that in world where abundance is ever present, technology allows us to keep and curate memories that we may have otherwise have lost. I recently had a moment of meta-reflection as I went through my posts and adjusted the categories having moved from Blogger to WordPress. It was an interesting experience skimming back through what I had written. 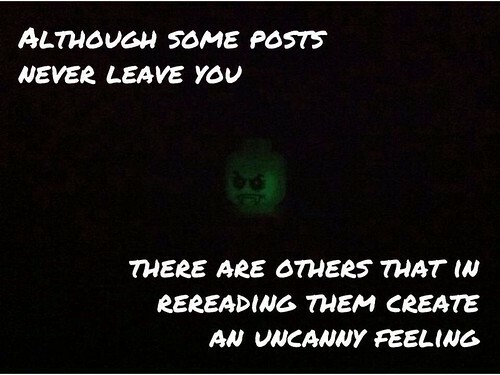 Although some posts never leave you, there are others that in rereading them create an uncanny feeling. That moment where you have to check yourself, wondering if you actually wrote it and what was going on at the time. A message from the past to remind you of those underlying values, beliefs and events that sometimes drop out of our memory overtime. Celebrating Other Voices in the Moment – I don’t think that I realised how raw this post was until I looked back on it a few months later. I remember getting a few tweets at the time about how open I was, but sometimes when you are in the moment you don’t always see that. Perspective can take time. I have reread it a few times since and each time it reminds me to always be mindful of those moments that are so easy to pass on by. This Is My #EduDream What Is Yours? – It is a challenging exercise laying out your supposed dreams. Not only is it difficult to articulate them in a meaningful manner, but there is a certain lie and fragility in giving voice to them. For dreams and ideals are are neither static nor wholly our own, therefore to commit oneself to such a fixed notion can miss something. For as I have written in the past, ideals are not always ideal. Interestingly, one person stated, such ‘dreams’ are best formed collectively as a community. I have subsequently found that the more I engage with others in education the more I question each of the assertions I laid down. I critique them and they continue to evolve. For as I have mused elsewhere, ideas are best held loosely, for it is only then that they can actually grow. 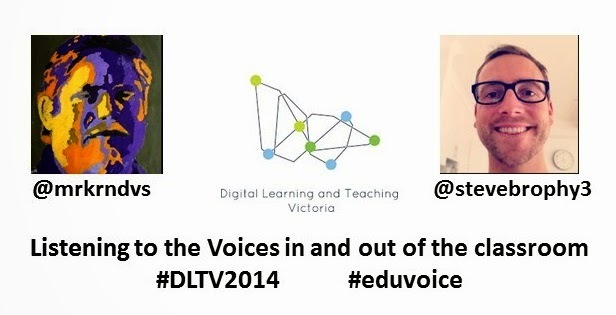 Learning to Learn by Learning – a Reflection on a Collaborative Project – This was an attempt to collect together my thoughts and experiences in regards to a presentation Steve Brophy and I did at DLTV2014. I say ‘attempt’ because even though the conference has long gone, the actual experience continues on. I initially contacted Brophy with two thoughts in mind: how do you collaborate on a topic with someone from a different educational background who you do not necessarily know and what would be an alternative format to the usual conference experience of chalk and talk. Without a script to go by, to ascertain ‘success’, I often think back over the choices we made and wonder. Would it have been different if we weren’t in a lecture theatre? Could we have done anything to make the session more interactive and hands on? What did people actually come away with? Going out on a limb into the unknown as we did, I think that it will be one of those moments of learning which I will always come back to again and again as a point of reflection. Although these posts may not have been the most read by others, they are the posts that mean something to me and sometimes this is the forgotten element. For as Pernille Ripp recently wrote, “Start your blogging journey for yourself”. To add to that, make sure it is always about yourself first and fore-mostly. I remember reading a post from Doug Belshaw in which he wrote a letter to his past self with some advice and general pointers. Flipping this idea, I think that we can undersell our past selves for failing to find the solutions for tomorrow. Stopping and looking back on the past can be often be the catalyst needed to drive you forward. Blogging provides an easy means for doing this. 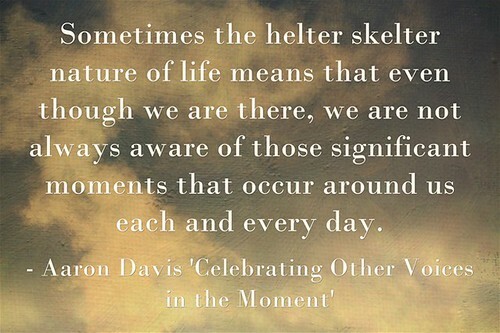 So what are those moments of learning that have made a difference with you this year? Would love to know. See you in the new year. What’s So Digital About Literacy, Anyway? This is My Edudream, What is Yours? Uncanny Reflections on a Year Blogging by Aaron Davis is licensed under a Creative Commons Attribution-ShareAlike 4.0 International License. Aaron, poignant piece as always! I have been thinking about the reflective element of my own personal learning so your post really hit home. Too often we are eyes forward, moving at high speed and not often enough do we take the time to look back at our path and celebrate the highs and lows of the journey. Our collaboration was part of a really significant learning growth for us both and most excitingly the start of many more discussions, encounters and projects.